Awake my soul and sing… – Journey to my heart…. I am working on getting my Christmas letters out. I am about 70% done and planning to finish them up this weekend. But there is something I wrote in it that keeps coming back to me. I ended my letter with the following: I pray every morning that I will live out the words I encounter as I come down my stairs to face my day: Awake My Soul and Sing! I see it every day as I walk down my steps. I find that I leave my house curious…. Curious about what song my soul will sing each day? Curious if I will learn a new song or if there will be a dance in my step with the song of my soul? 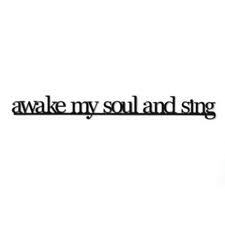 I wonder how your life would be different if you awoke every morning and invited your soul to sing…. Give it a try….it is an invitation that has the potential to brighten even some of the more difficult moments! Next Next post: Step by Step….